By the year 2100- a mere 85 years from now -, scientists project that temperatures will have melted polar ice enough to have raised ocean water levels in the Pacific nearly 10 feet. If this does occur – and it seems likely – north Ocean Beach will have a new beachfront, with Bacon Street being the new Abbott Street, right at the water’s edge. 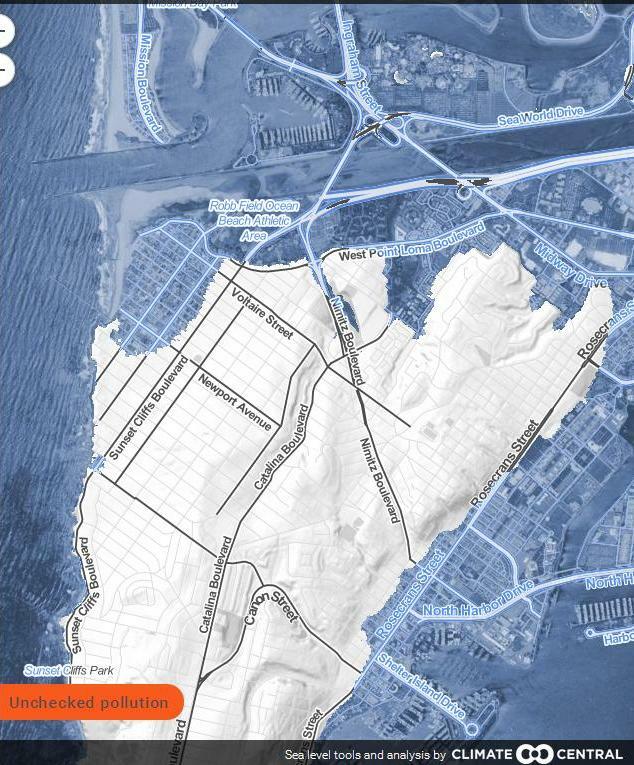 According to maps just released last week from a group of scientists who have studied climate change, the projections of the effects of sea levels rising for coastal communities around the globe, including Ocean Beach and the rest of San Diego, are very disquieting. Not only does north OB have a new waterfront, according to the map projections, Dog Beach goes under as does lower Voltaire Street. A good chuck of Robb Field falls into the water, and whatever it’s called either Saratoga Park or Ruth Held Park – it’s bye-bye, and the new million dollar condos will need a draw bridge for the upper floors. Famosa Slough is enlarged, of course, and engulfs all those low-lying land near it. All of Mission Beach becomes permanently submerged, the Silver Strand disappears, and Coronado becomes an island, as does Point Loma. None of the scenarios on Climate Central’s Surging Seas map look promising. The default setting of “unchecked pollution” is more unsettling, with Ocean Beach, significant portions of downtown, and much of the land from the airport to the Sports Arena permanently submerged, along with all of the manmade islands carved out of Mission Bay. These figures assume warming of 7.2 degrees by the century’s end, and an accompanying 29.2 feet of rising oceans. Climate Central activists (who describe themselves as “an independent organization of leading scientists and journalists researching and reporting the facts about our changing climate and its impact on the American public”) say they can pinpoint when emissions might reach a point at which a certain level of sea rise is locked in, but they can’t say how long it will actually take for the water to arrive. This is what happens if we do nothing. A quarter of OB disappears. Or maybe that doesn’t happen at all. Are you really denying the consequences of our effect on climate change? Willful ignorance is something else entirely. When did questioning science become ignorance? Aren’t scientists supposed to continually test hypotheses? Didn’t we once assume with 100% certainty that the earth was flat? That wasn’t science – that was religion. That’s not true. No religion espoused the dogma. The 3% of scientists funded by oil companies is great. You don’t think the vast majority of scientists in the 97% are funded by governments and environmental groups? What’s the difference? Group think? 97% of scientists agree that climate change is real and man-made. The other 3% are largely funded by oil companies. The only reason I slightly agree with your original statement is because I’m an optimist and history has shown that for the most part, humans create solutions to problems before they become “too big to fail.” Technology is expanding at an incredibly rapid exponential rate, and many futurists believe we are at the elbow for tech on an exponential curve (which is right where things begin to explode). If 97% of a group believe the same thing, you should be very, very worried. I could prolly get like 97% of people to believe smoking cigarettes is bad for you. Even smokers. Like the belief in some White Dude in the sky who created you? Climate is always changing. The mistaken belief that nature is somehow lovingly in balance is myopic. We are probably not the first species on this planet to affect climate. About 2.3 billion years ago, cyanobacteria produced enough oxygen to saturate the oxygen sinks and create the”The Great Oxygen Event” that brought atmospheric oxygen levels to the point where it wiped out the cyanobacteria (and triggered the longest ice age the planet has known). We are the first species with the ability to do something about our affect. How appropriate – and certainly the one atop the American flag pole will be the last one to submerge. Just popping in to clarify that those sea level changes will be “locked in” via irreversible climate change given the projected paths society might take between now and century’s end…but it doesn’t necessarily mean the changes will actually occur in those time frames. 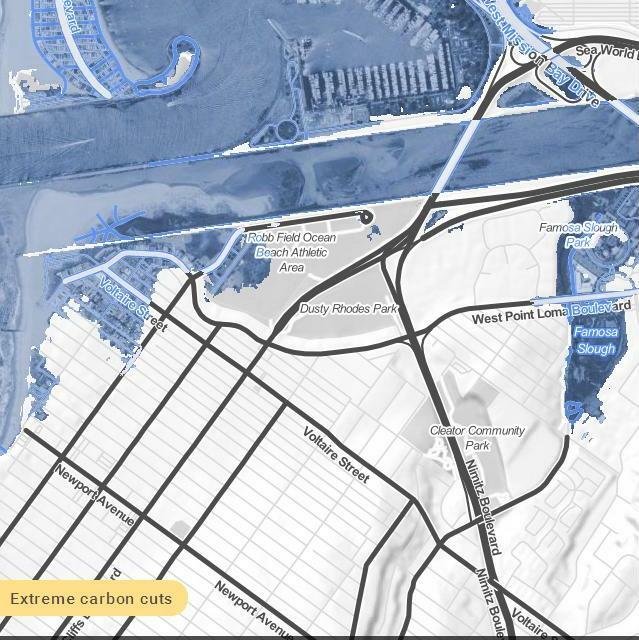 Slow climate change enough and it could take decades or even centuries for the worst of the scenarios to come true…regardless, both my old apartment and new one are submerged on the ugly map – yikes. Thanks Dave for the clarification, and especially thanks for the work you do on this issue – even though it’s for a competitor. Once Pt. Loma becomes an Island, then we declare our own nation-state. We won’t exactly have an army, or even much industry, but the weed-tourism should be enough to sustain one hell of an economy. Sitting in the sun; riding our hover-bikes. If only I can make it there by cryogenic suspense, count me in! Can we start earlier than 2100? A bunch of us actually looked into making OB a separate entity, its own municipality … but not enough tax base was our conclusion in 1974. Chicken Little, the sky is falling!! Humans are funny critters. We worry ourselves silly over what may or may not happen a hundred years from now while we ignore the human condition here and now. Ohhh no the sea levels are rising. Ohhh no we are in a drought. Ohhh no, more and more people are living and visiting California. Solution. Lets make more and more Desalinization plants, and use the ocean as our source, to keep the sea levels from rising any more. the problem is there are plenty of externalities associated with desalination. During the Ice Age, the ocean was 320 feet lower than it is now. Maybe we should do like the Dutch, and just build dykes–really big dykes. This might change our surf breaks a bit…..